We are not electing a pastor. We are electing a President. We are not seeking a messiah- we are seeking a man who understands the fundamentals of a modern society and has the requisite wherewithal to provide leadership to a nation. Nigerians are not looking for angels to vote for. We just want someone who will provide reasonable leadership, understand the basics of the economy, demonstrate a balanced understanding of the different geographies that make up Nigeria, be cosmopolitan in approach and be fair to all. Atiku ticks these boxes for me. In addition, out of ALL the candidates, he’s the only one talking about restructuring. I believe the greatest danger to Nigeria is Muhammadu Buhari. Never has the nation been so factionalized along tribal and religious lines like now. He has taken nepotism to unprecedented heights. His incompetence stares you so much in the face that you can’t ignore it. He has pauperized the economy. He has demonstrated sufficient capacity in making bad things worse. His insensitivity is unmistakable. His lack of empathy is unpardonable. All men of goodwill who have the interest of this nation at heart must say enough is enough! I’m not sure this nation can survive another 4 years of Buhari. I have had people ask: shouldn’t we look the way of younger elements such as Omoyele Sowore, Fela Durotoye, Kingsley Moghalu or Tope Fasua? I’m a pragmatic realist. I used to be a blue-eyed unrealistic optimist but no more. You don’t send a boy to do a man’s job. Sowore does not have the structure to become Nigeria’s President. Can he get people to man the over 120,000 polling units across Nigeria? How many governors will Moghalu’s party YDP produce? How many Reps and Senators? Who knows YDP in Akoko in Ondo State or Odeomu in Osun State? The best candidate so far in terms of ideas is Kingsley Moghalu but he can’t win because he doesn’t have the structures. I have had the opportunity to speak to a few of them to plead that they drop their ego and present just ONE candidate. I truly admire what they have done but courage is totally different from brawn just like strategy is different from energy. We can also hijack by joining already established structures and work our way up. Or by taking a piece at a time. I suggested once to a member of Sowore’s campaign team that he should contest as Governor of Lagos State. His Take It Back campaign will reverberate across Lagos as many are already tired of Tinubu’s stranglehold. Sowore might not have enough resources to cover the entire nation but he has enough resources to cover Lagos. With his incredible energy, he would have covered the 20 Local Governments in Lagos many times over. He has enough street credibility to match MC Oluomo man for man. He will get activists to line behind him and give Tinubu a real fight- unlike Jimi Agbaje who has no fight left in him. You can’t crack palm kernel nuts without making crushing efforts. If he succeeds in taking over Lagos and he transforms the State in such an unprecedented manner in 4 years, he will be ready to negotiate for the whole country. Everyone will beg him to be President. Lagos is the most important State in Nigeria and anyone who has it has a strong bargaining power to chip. This is an example of a strategy road map I proferred. If you’re going into a battle, wisdom dictates that you must count the cost whether you have sufficient ammo to finish the battle. If you don’t, you’ll expose your lack of critical thinking- one reason I wasn’t impressed with Oby Ezekwesili. They all have not built sufficient structures to lead or govern a complex entity like Nigeria. Anyhow you want to look at it, rebuilding this nation is a marathon and not a dash. Either way, power is never served a la carte. The reality on ground- and I do not deceive myself- is that it is either Buhari or Atiku that will win the election. No other party has been able to build structures and penetrate all the 774 Local Governments in the nation. Even illiterates know the broom and the umbrella. Nomads may not be able to operate a smart phone but they know PDP and APC. This is why I don’t think any Third Force will make any reasonable impact. If you can’t make a difference, why bother? The situation on ground is too dicey for experiments. Time is running out on this nation. And this is where I consider the thought of wasting one’s votes on a ‘Third Force’ as illogical and absurd. I have only ONE vote and I intend to make it count. Even the so-called Third Force parties or movements are now busy endorsing either Buhari or Atiku. I want to address the issue of Atiku’s corruption. When Atiku was with APC, why didn’t they shout about his corruption then? Why did they praise him to highest heavens? 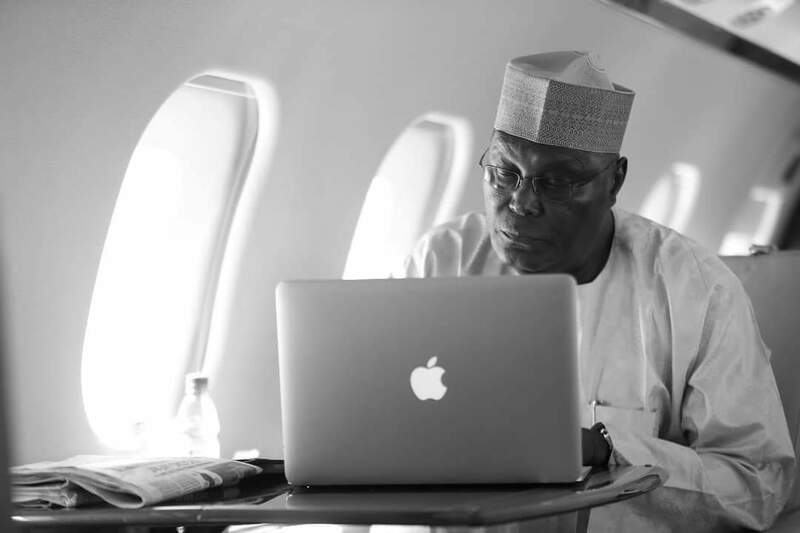 Why did Buhari fly in Atiku’s private jet all over Nigeria? Why is he now corrupt when he decamped and left for PDP? Why hasn’t he been convicted if they truly had evidence against him? Why didn’t Lai Mohammed carry out his threat to get him arrested on Bank PHB issue when he travelled to the US? Let me go deeper. Who are those surrounding Buhari? Is Atiku more corrupt than Tinubu? Or Amaechi is no longer corrupt? Or Fashola who dug two boreholes in Lagos at a cost of N139m as alleged by his own State not corrupt? Is one corruption greater than the other? I don’t want to go into the various scandals emanating from important figures in this administration. No one should pull the wool over our eyes- corruption is alive, well and probably stronger. Am I saying Atiku is not corrupt? No. But has he been convicted? Is he not innocent until he’s proven guilty? He has been out of office for years without immunity- even till now. So if Adams Oshiomole who has a petition against him in EFCC allegedly gathering dust can lead the President’s party, no one in that party should pontificate about the corruption of another. Get a conviction or get out. Having laid this foundation, I make bold to ask: where has the much touted integrity of Buhari taken Nigeria? We are worse off than we were 4 years ago. Integrity without competence won’t take you anywhere. Buhari doesn’t have it. All the indices that make for a great nation are south ward. People leave this nation in droves daily because they can’t see a future. We need someone who can urgently pull back the chest from the fire. You face an enemy size for size. You don’t confront an enemy who has missiles with a machete. Atiku- warts and all- is the only one who can match Buhari. At least, this is clearly evident from his campaigns all over the nation. His combination with Peter Obi is like a bowl of amala with gbegiri and ewedu garnished with well-tendered goat meat. Both men understand how to run modern businesses. Both men have made a success of their individual careers and businesses. Atiku is liberal, cosmopolitan, refined and knows how to spot talents. Peter Obi is a great manager of resources and outstanding technocrat who has been exceptional in leadership. Many years out of office, he is yet to be accused of a single case of corruption. We need leaders who will pull the nation back from the brink, heal our divides and restore hope. If there is one thing I know, Atiku will handle the economy better. He will have a much more colourful cabinet. He will not be nepotistic. He won’t lock up El Zak Zakky for months and refuse to release him in spite of court orders. He won’t look away and gloss over the murder of over 300 Shiites. He will heal the divides of this nation. That is not asking for too much. If Atiku Abubakar wins and does not perform to expectation within 4 years, we will kick him out too. We will keep changing our leaders until we get the one that is fit for role. This is my stance. *Adeyinka, a public affairs analyst, wrote in from Lagos.